Ahh I wish I feel 100% normal again! Hate my coloring and how tired I get easily. Well on bright side I can craft again. I decided to write out the sentiment on left instead of running up and down printing it. Very cute card!!! Love it!! Some teenagers should make note!! LOL!! Thank you for joining us at the Pals Paper Arts!!! Pam, So cute and such a great message. Love it! Thank you for playing with us at Pals Paper Arts. 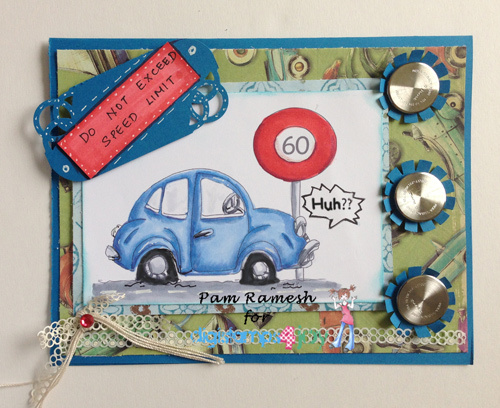 Love it Pam :) You are soon going to be back at top speed - hang in there. Your card is so fun Pam! Love the design & the message. Thanks for playing with PPA. Wonderfull card. Love the image, fabulous. This card made me laugh! Love your recycling and how you colored your cute digi!